Various predictions estimate the IoT ‘thing’ population to be on the order of 20 billion planet wide, and ~500 per household. Interacting with 500 or more objects on a daily basis could be a nightmare-ish prospect in a world where there is a separate App as the interaction gateway for every one or a few IoT objects in the home. ‘Far field’ voice technologies(e.g. Echo) have garnered mindshare this year as a promising way to interact naturally in home environments. Chatbot technology has come the forefront in 2016 as a pragmatic way to package Voice, AI and Natural Language into a high performance form of interaction for a global user base increasingly living in messaging platforms. How can we best combine incumbent App technologies with voice and AI to remove the friction in IoT UXes and drive demand for more devices without users fearing interaction nightmares? This talk will cover perspectives on addressing this question, based on experiences from designing consumer products (connected lighting and beyond) in the consumer IoT space. Venu is a technology entrepreneur with track record of successful products at the intersection of User Interfaces, Intelligent Agents, Big Data and Media. He worked with Dag Kittlaus (of Siri fame) to create the mobile industry’s first zero-click interface for mobile, created the first Google Glass experience for TV, natural language processing technology for an ARRIS video analytics and big data platform recently acquired by WatchWith, and a social analytics platform leveraging Twitter that was featured in Wired Magazine and BBC. In the past, he also worked on a $50M government research initiative on Intelligent Agents for distributed enterprises. He is VP of Data Science and Machine Learning at Lightpad, a consumer IoT company, runs next.io, a startup advisory, and is an adjunct faculty at Rice University’s ECE department working on AI and context-awareness. 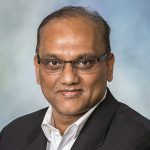 Venu holds a Ph.D. (Databases & Artificial Intelligence) in Computer Science from The Ohio State University.